In today’s competitive business climate, companies are looking for capabilities and services that can enable them to perform more efficiently. At MapleLeaf Technologies, we offer our expert managed IT services that are targeted at equipping your company with dynamic and professional solutions for managing and organizing your IT environment. Our monitoring solutions are quite flexible and scalable, which support the functionalities that are required for efficient operation of business. Threats keep evolving and so does our security strategy. We leverage our experience to bring security to your world so you can worry less. MapleLeaf Technologies will act as a bridge between your company and other IT products and services vendors to pick the most relevant technology solution for your business. Your business runs on servers. 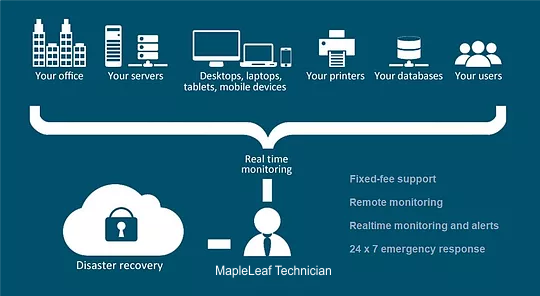 MapleLeaf Technologies will monitor, maintain, protect, and care for your critical technology needs such as fault management, troubleshooting, connectivity monitoring, and in deriving advanced analytics. The extensive and well-organized services in network monitoring include various essential activities like mapping the network infrastructure and traffic flow, measuring the network performance, implementing automated notification systems in cases of failure. Bandwidth management is important if you are using multiple sources of bandwidth. Internet connectivity is very crucial for our business and any outage will impact the business adversely. So it will be desirable to have at least two sources of bandwidth and manage them for optimum utilization and 100% availability. We can help you configure optimum utilization of available bandwidth. Selecting the most effective tool, deploying it to provide maximum protection. Keeping this software up-to-date. Monitoring reports and detecting and eliminating any threats to the operation and data. We offer user level support to keep the workstations in up-to-date condition with all updates and patches for operating system, applied regularly. Establishing best practices for peak performance from each workstation, suggesting required hardware updates, and installation of new software are part of our services. Printers, other devices with computer interface can be configured and integrated into the network for seamless operation. Secure access to network and its resources will be established using state-of-the-art device, as the data security is a very important aspect of healthcare business. We work closely with the management team to establish best practices in data backup and disaster recovery. We analyse current practices and evolve a long-term strategy, based on the need and budget. When your staff has issue with technology, they have someone to call. Our helpdesk is unlimited, friendly, and fast. We monitor Internet, power, security threats, hardware health and many other important things that can slow down your operation, to proactively avoid as many interruptions to your workflow as possible. Our IT infrastructure will be architected with level of redundancy, and data backups to minimize the emergencies, however when worst occurs, MapleLeaf Technologies will team will stand with you to restore the operation in the quickest possible time. We shall maintain an accurate inventory of all your IT assets so you have full clarity into your technology investment.